I stumbled upon this fascinating article about one reason low-income families are still not shopping in large numbers at farmer’s markets. Access is, of course, one issue. If you don’t have transportation or a farmer’s market near you, you are probably not going to go searching for one. But, as access to fresh fruits and vegetables in low-income areas increases, farmer’s markets are still not seeing the turnout they expected. Why? This article addresses the issues of education and awareness of not only what you can find at farmer’s markets, but also how to pay for it. Many markets have vendors now who accept SNAP food assistance, but it seems that many consumers don’t realize that or understand how it works. HERE is the link to the article itself. An interesting point of discussion. At my farmer’s market runs this weekend, I am going to ask the vendors I use whether they accept SNAP and how it works for them. In my area, I think a lot of older people understand how to cook fresh vegetables. North Carolina has always been an agricultural state and most people I meet over the age of 50 grew up either on farms or near their family farms. Most worked on farms. Hard work, for sure. It’s the younger people who I think need education of a different kind. They need to learn how to cook. Nothing against microwave ovens (they are helpful), but the proliferation of microwaves and processed frozen foods have left us with at least one (and probably two) generations who have absolutely no idea how to cook from scratch. When you have no idea how to cook fresh food, you either don’t buy it or you buy it and it rots in your refrigerator because it seems like too much work. 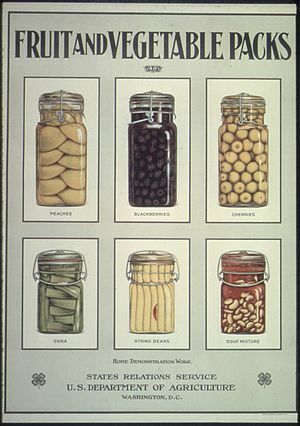 In the 1930s, 40s and 50s, County Cooperative Extension offices around North Carolina had home demonstration agents who traveled to rural and urban areas around the state teaching women how to create balanced meals and how to can and preserve food safely. Now, some of these programs were condescending and a little misguided, especially in the South. But we need this kind of intentional effort now, offered in a more user-friendly way, to reach out to young people and young families! Do you see efforts in your area to increase education about how to use farmer’s markets? Efforts to improve cooking knowledge? Inquiring minds want to know. Share! I learned so much in my meeting with the NC Catalyst effort last week and the fact of the matter is that there aren’t systems in place for people to pay with their SNAP benefits at most markets. The vendors can’t make change so the prices have to be adjusted to come out evenly and then the farmers have to get paid. A whole other issue. It’s way more complicated than it should be and from a retail perspective I had some ideas that would simplify the process but because it had “never been done that way” it got shot down (for the record, my idea is better than theirs). The system they want to use involves wooden nickels (What?!) and EBT users paying at a tent. My market will not be accepting credit card payments so the SNAP users will stick out being the only people paying at the tent. Fresh food should be available to ALL the people! Agricultural state or not, NC is a hot mess. I found some crazy statistics that will probably interest you– I’ll be emailing you later! Can’t wait to read the article!! Awesome! Here is my info about SNAP users and veggies. In several markets I have seen, vendors have veggie bundles or packages that correlate to SNAP payment amounts. So, instead of just pickup up loose vegetables or fruits, you can buy a container of broccoli or whatever that is $2.00 or $5.00–no weighing and no making change. The Western Wake Farmers Market uses the token system (the little wood coins). The farmers hate it and some won’t take it at all. Most of the farmers at that market now either accept cash only OR they have smartphone card swiper things so they can take debit and credit cards via their smartphones. I even had one of those so our cookie booth could accept debit/credit cards. This is not hard, it is not rocket science, and many small businesses (like craft vendors at festivals) are already using them. So it seems like there are many more options out there. I am going to send you a link to an Indiana farmers market that offers SNAP customers a double veggie day where they get double the veggies for their snap accounts. And, by the way, you are very cool. I actually like the pre-weighed SNAP-friendly amount idea. I’ll pass that one along. The wooden nickel thing is annoying and honestly I think it is pretty tricky for the farmers to get paid. The reason they do it that way is because you have to be licensed to accept the food stamps. So if you own a market or a store, you fill out an application and then when you’re approved you’re assigned an FNS#. That number is for the whole venue. There are a few vendors that accept credit cards with the little phone-swipe thing (smart on you for taking that for cookies!!) but they can’t have individual FNS #’s so SNAP can’t be processed that way. I’m fixin to skip all this mess and just plant a garden in every community. Ha. Wishful thinking. Thank you so much for taking the time to ask around for me. I really appreciate it! !